Some social media platforms are remarkable tools for sending your word out. Unless you don’t talk about your business how do you expect to sell it to the global audience? But, while marketing products people often find themselves amidst the confusion of going the right way in. Do you often find yourself surrounded by common mistakes? The type of mistakes you wish you had never made. If you think Pinterest is simply a platform for lifestyle blogging, then you are definitely wrong. Today most smart brands and businesses are incorporating Pinterest as a key part of their digital marketing strategy, because, this visual discovery platform promises to increase not only the sales for your business but also polishes your brand awareness to a whole new level. I hope it doesn’t come to you as a shock but almost 50 percent of the purchases online are made because someone has come across a promoted pin (i.e. through Pinterest ads). About 67 percent of the people claim that they have discovered a new product or brand by seeing posted content on Pinterest networks. It is a common observation that businesses which are inclined to leverage the power of popular social networking websites such as Facebook, Twitter or Instagram are more likely to see succeed than others. Facebook and its properties including Messenger, Whatsapp and Instagram has more than half of the world’s Internet audience. In fact, there are other powerful social media platforms such as LinkedIn and Pinterest which do wonders. To get more clarity on what type of traffic come to Pinterest on average, here’s an insight to its user base. If you are searching for a platform to market your online business, then look no further than Pinterest. It is the new trend in town which has taken over half the world. Pinterest likely gets the exposure it deserves. Although it looks a simple image blogging platform it is much more than that. This powerful social media tool is something which digital marketers can not afford to ignore. With Pinterest, you can boost your brand reach, you can get a good market exposure, you can build your specific audience, and you can increase your sales. To help you understand which elements should one keep aside before marketing business through Pinterest, our pals at Branex have created this amazing infographic just for you. So, free up some time from your busy schedule and have a go through, it will hardly take a minute or two. 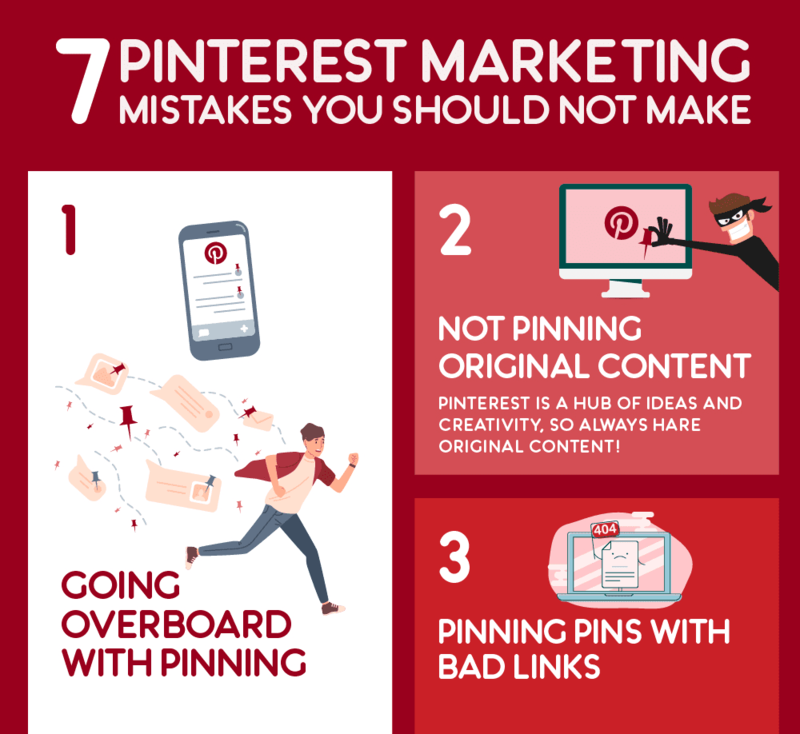 The infographic highlights some of the biggest mistakes businesses make on Pinterest, so you can avoid them next time when you are marketing on Pinterest.